Tanks! 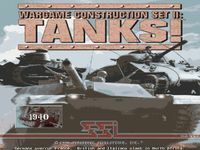 is a tactical (platoon/section level) wargame of 20th century mechanized warfare. In most scenarios, you control brigade or regiment-sized forces. The scale of the game is 250 meters/hex, 5 minutes per turn. Individual units represent sections, batteries, platoons or (in the WWI scenarios) companies of from one to twenty vehicles or infantry squads. Maneuver formations are companies, battalions, or brigades.